Thomas Lanier Clingman was a unique man. Born and raised in western North Carolina, Clingman studied law at the University of North Carolina at Chapel Hill. He later settled in the Ashville area where he bace a prominent politician. He strongly supported Unionism until it became inevitable that North Carolina would secede. He then fully backed the Confederacy for the sake of his state. 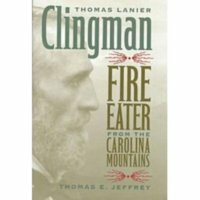 Thomas E. Jeffrey, Thomas Lanier Clingman: Fire Eater From the Carolina Mountains, Civil War Era NC, accessed April 24, 2019, https://cwnc.omeka.chass.ncsu.edu/items/show/374.